A Map of Long Island. This is a charming 1961 pictorial map of Long Island by Courtland Smith. 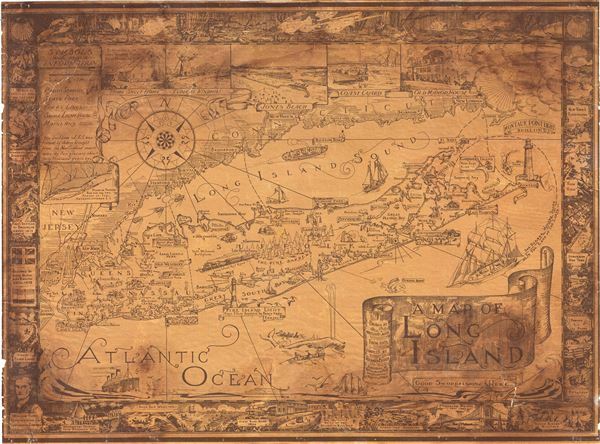 This historical map covers from New London in Connecticut and Fishers Island south as far as the Lower New York Bay and Staten Island. Long Island is depicted in its entirety from Brooklyn and Queens east to Montauk. Throughout, the map notes cities, towns, beaches, radio stations, parks, ferry lines, lighthouses and several other important landmarks, scenes and activities. Several landmarks have been attractively illustrated, including the Montauk Point Light, Fire Island Light, Southampton, Coney Island, etc. Gardiner's Island - 'here Capt. Kidd buried loot' and Oyster Park â€''Burial Place of Theodore Roosevelt' is noted. The top left quadrant of the map includes the note, 'The backbone of L.I. was formed by debris brought from the New England Mountains by two glaciers about forty thousand years ago' as well as an inset featuring a 'Diagram showing how far the two Stages of Ice Advance covered L.I.' Five beautiful illustrated views along the top border include the Birthplace of John Howard Payne East Hampton, a Typical Windmill, Jones Beach, Coast Guard and Old Manor House. A decorative compass rose and an art deco style wind figure are also featured. In Long Island Sound and the Atlantic Ocean, pictorial illustrations of Boston Boat, ships, striped bass, a swordfish, whale fishing, and the Sag Harbor Whalers that 'sailed to the ends of the Earth' can be seen. The map is surrounded by an elaborate border, with underwater scenes at the top and historic events and places along the remaining three sides, including the '13 Tribes of Indians when First Settlers Arrived,' 'First Settled at Brooklyn in 1614,' 'First Rail Road 1836,' 'Brooklyn Bridge 1867-1883,' etc. That map has had a significant impact on the development of not only Southampton, but all the other towns on Long Island that it features. This map was drawn by Courtland Smith from data compiled by Richard Foster and published by The Billboard Barn, Southampton, L.I. It was printed by Gerson Offset Litho Co., Inc., New York. This map, first printed in 1933 became extremely popular and has since been widely reprinted â€' the present example is the 1961 edition. Very good. Overall toning and varnish on recto. Damage in top left and lower right quadrants repaired on verso. Some foxing and staining along corners. Rumsey 8602.000. New York Public Library, Map Division, 10-301.